It's SEA in all-caps in the title, because it also refers to the Mystic Society of Enochian Anchorites. The artist and author of the Navigators Tarot of the Mystic SEA, spent many years at sea working in the yacht charter industry and skippering sailing vessels on long passages. In 1988 an amazing escape from certain death in a car wreck encouraged the "Navigator" to ask the universe what might be offered in return for this unfathomable grace. 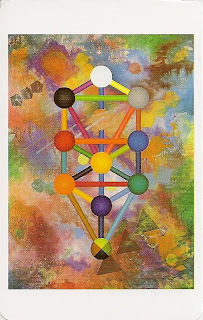 The Navigators Tarot of the Mystic SEA is based on the traditional Golden Dawn foundation of the Hermetic Cabala, with the Tree of Life on the back of the cards. 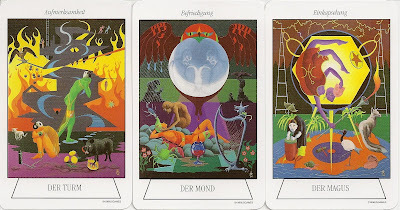 A keyword (representing the most important quality of the card) is written at the top, while the card title (for the Major Arcana), suit and number (for the Minor Arcana Pips), and title and suit (for the Court Cards) are written at the bottom of the card. The Major Arcana are not numbered, most of them have standard titles, with the following exceptions: Universe (World), Aeon (Judgment), Art (Temperance), Suspension (The Hanged Man), Destiny (Justice), Fortune (The Wheel of Fortune), Arch Priestess (The Priestess), Magian (Magician). The four suits are ment to represent four different aspects of the psyche: Wands represent Intuition, Cups represent Emotions and Dream States, Swords represent Intellect, and Pentacles represent the Five Senses. The book also includes Julia Turks poetry for each card.